The 2005 anniversary cover of The Eastern Fells. Apart from the bottom banner, the design has not changed since first publication. A Pictorial Guide to the Lakeland Fells is a series of seven books by A. Wainwright, detailing the fells (the local word for hills and mountains) of the Lake District in northwest England. Written over a period of 13 years from 1952, they consist entirely of reproductions of Wainwright's manuscript, hand-produced in pen and ink with no typeset material. The series has been in print almost continuously since it was first published between 1955 and 1966, with more than 2 million copies sold. It is still regarded by many walkers as the definitive guide to the Lakeland mountains. The 214 fells described in the seven volumes have become known as the Wainwrights. As of 2013[update] the LDWA register of those who have climbed all the fells listed 674 names. 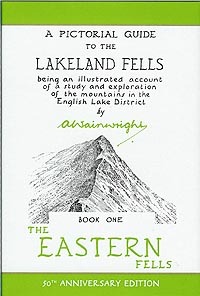 The Wainwright Society maintains a "register of current Society members who have climbed all 214 fells"
The second impression of Book One, released at Easter 1956, came with a dustwrapper, and customers who had previously bought a jacket-less first impression could obtain a dustwrapper from the printer. As a result, most first impressions of Book One still in existence usually have a dustwrapper priced at 12/6. In 1992, a year after Wainwright's death, Michael Joseph took control of all of Wainwright's books, including the Pictorial Guides, a change of which Wainwright himself was in favour. When they ceased publication in 2003, the rights were bought by Frances Lincoln who shortly afterwards embarked on a revised Second Edition of the guides. A typical page from The Southern Fells, describing an ascent of Pike of Blisco. The diagrams of ascent are perhaps the most innovative feature of the Pictorial Guides. Each of the fells covered by the guides has its own chapter, which normally includes a map of the fell, comprehensive details and 3-dimensional drawings of ascent routes, ridge routes to other fells, routes of descent and a description of the summit. Carefully annotated pen and ink drawings of ascents and views accompany the details of each fell. Each book starts with a description of the geography of the area and ends with Some personal notes in conclusion. Book 1: "The Men of the Ordnance Survey"
Book 2: "The Men who Built the Stone Walls"
Book 3: "The Dogs of Lakeland"
Book 4: "The Sheep of Lakeland"
Book 5: "The Solitary wanderers on the fells"
Book 6: "My right leg and my left leg"
Book 7: "All who have helped me"
A 50th anniversary edition and a box set of the original edition have been published. Leather bound versions can be found secondhand. Between 2005 and 2009, the series was factually revised by the publishers Frances Lincoln, to adjust the content to the present-day Lake District. Chris Jesty undertook the revisions, using an imitation of Wainwright's hand lettering to make the alterations look as unobtrusive as possible. The most notable changes are that the covers of the revised books show photographs of the Lake District by Derry Brabbs, rather than the drawings that were on the covers of the originals, and the maps show the main paths in red. Revised editions of Wainwright's other Pictorial Guides, A Coast to Coast Walk, The Outlying Fells of Lakeland and Pennine Way Companion were published between 2010 and 2012, with the amendments again being made by Chris Jesty. Revised editions of Walks in Limestone Country and Walks on the Howgill Fells were published in April 2014. As of 2014[update] a third edition of the guides, known as the Walkers Edition, is being prepared by Clive Hutchby. Book One: The Eastern Fells was published in March 2015; Book Two: The Far Eastern Fells was published in October 2015. Book Three: The Central Fells, was published in March 2016. Books Four, Five, Six and Seven will follow in 2017, 2018, 2019 and 2019 respectively. The 214 fells included in the series are now generally known as 'the Wainwrights'. These range in height from 985 feet (Castle Crag) to 3210 feet (Scafell Pike). Completing all the Wainwrights is a popular peak bagging challenge. The Wainwrights differ from other bagging lists such as the Munros and Marilyns, however, in that Wainwright never set out to compile such a list himself, and inclusion is not based on objective criteria such as elevation or prominence. ^ The Wainwright Society – The Alfred Wainwright Centenary 2007 Archived 23 December 2008 at the Wayback Machine. ^ Thompson, Steve. "Wainwright guides face the axe". The Guardian. Retrieved 2 June 2014. ^ Backhouse, Steve. "Walking the Wainwrights". Scouting. The Scout Association. Retrieved 2 June 2014. ^ "Hillwalkers' Register". Long Distance Walkers Association. Retrieved 2 June 2014. ^ "Wainwright 214 Completers Register". The Wainwright Society. Retrieved 2 June 2014. ^ Ratcliffe, Roger. "On the Dales trail of a true pioneer". Yorkshire Post. Retrieved 2 June 2014. ^ Clarke, Anna. "Updating the Wainwright walking books will be a labour of love for Clive". Westmorland Gazette. Retrieved 2 June 2014. This page was last edited on 13 October 2018, at 14:18 (UTC).